Sony Android TV Set: Sony presents the thinnest Sony Android TV Set in India. Sonny India has introduced the latest technology based on Android with LED TV in India this week. Sony has made some further experiments with this device and has launched one Sony 4K Smart LED TV and thinnest television set in the world of the Indian TV market. The new Sony 4K Smart Android LED TV has wide range of UHD that the thinnest TV which has the thickness of 4.9 mm, a powerful sound system and a clear screen. This new model is in the range from 43 inches to 75 inches and also includes the new series of five with 13 brand new models of smart television price of only Rs. 69,900 TV for the model of 43-inch Full HD LED TV. 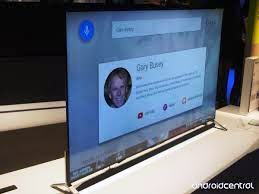 Some additional features that Sony added in new Sony 4K Smart Android LED TV are that this device also supports Android technology and can be able to run official Google android TV software with the Android version 5.0. Not only it supports Google android TV software but also offers support for several Google Play Store TV applications. Sony says that its new Sony smart TV is the first Smart TV with support of Android TV is available in the Indian market. This unit is compatible with the Google attributes as Google Play Store, Google Chromecast as streaming, Voice Search and connectivity with various accessories. This Sony TV set model also includes Serial Catch up TV apps and we alert informs the Bravia TV application and Android smartphone apps. TV screen offers a 4K that is 3840 × 2160 pixels resolution. It includes the Triluminos screen technology to produce increased precision and sensual shades of red, aqua blue and green colour, 4K processor to improve brightness, contrast and color accuracy. Supported by the scaling of advanced technology algorithm monitors the device the content and can enhance the non 4K content to 4K video quality. Therefore, Sony India hopes crazy about new Sony 4K Smart Android LED TV product this new Sony android smart TV will dominate smart TV market in India.